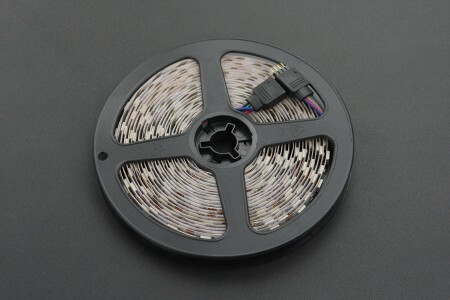 Nowadays, LED strip is becoming more and more prevalent in our daily life. Sometimes, especially in festival days, we even feel that there are no more fun and excitement without it. 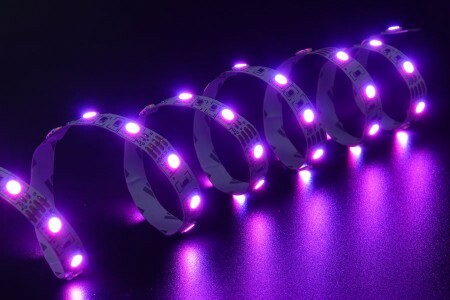 How about getting a cool LED strip and starting having a colorful life! This is a full-color flexible LED strip made of 300 tiny 5050RGB LEDs. It adopts three pins(R, G, B) to control the three primary colors and color mixtures. The tiny 5050 RGB LED is fairly easy to solder and can provide high brightness, large scattering angle and great consistency. Every three LEDs is an independent part, and each part can be cut independently. You can arbitrarily cut out these parts without damaging the rest or connect strips together to make them longer. Every LED can realize the changing of 256*256*256 colors and interact with each other to achieve extremely dazzling effects such as breathing, jumping, twinkling, gradating etc. With good flexibility, this strip of pure color can be arbitrary bent or cut off. The adhesive tape on the back of the LED strip makes it able to be fixed on anywhere. Power it up, you will be in a magical and colorful world in seconds. They can be used in home decoration, festival interactive activity, intelligent LED, shining DIY device, and so on.